It's summer. We're supposed to be eating salad and ice cream and grilling hot dogs and burgers. So who makes meatballs in the middle of July, anyway? A couple of weeks ago, I posted a picture of some cherries Kingston and I were buying at a roadside farm stand. Such glorious fruit! In my post I asked if anyone had ideas for what we should do with them. I was expecting suggestions on the sweet side, like some kind of ice cream, sorbet, or that summer classic, cherry pie. 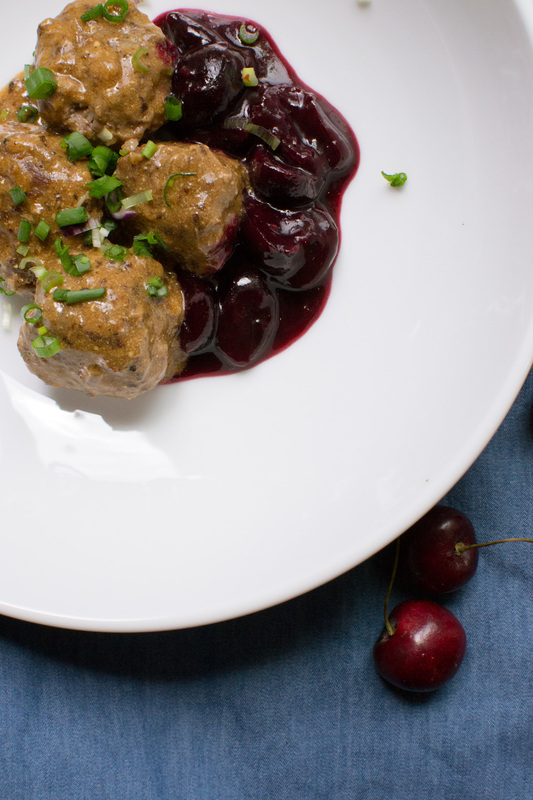 My sister, Margie, responded almost immediately with, "Flemish meatballs with cherry sauce!" Margie was in college when she traveled to Belgium one summer and met Patrick of Flanders who lived on a boat. After she came home, a period of feverish correspondence ensued before she soon returned to marry him. They have three children: Brett, Macy and Matt who grew up just outside of Antwerp in the northern, Flemish-speaking part of the country. My sister was so far from all of us here in the U.S. as she and Patrick raised their kids. But these young people! So beautiful. Sensitive and kind. Soon after her suggestion on Instagram, Margie sent me a recipe for the meatballs. Reading through it, I suddenly missed her more than anything. It might seem a little silly to get teary over reading about meatballs and not even while actually eating them (which would be more sensible, or at the very least might make more sense), but that's what happened. It surprised me that a recipe, this recipe, could do that. I had never eaten this dish before, never shared it with Margie, neither cooked it nor even heard of it until she mentioned it from thousands of miles away. But food will do that, won't it? Remind us of people we love and miss, bridge vast distances and encompass the complexity of all sorts of emotions. In 2013, when Kingston was about to turn two, we traveled to see Margie and her family on a two-week visit. It had been a long, long time since we'd seen each other. Here she is in beautiful Bruges, a UNESCO World Heritage Site, with Kingston. What he recalled for a long time after that trip was hearing the "klop klop" sound of the horses hooves as they took tourists around town. I remember gobbling down hot, fried potatoes at the frites stand (or, fritkot) in the center of town. Feeling befuddled as I stood downstairs at The Chocolate Museum, where I could not understand even a word of the heavily-accented English of the chocolatier who was giving a demonstration. Throwing a look at my sister, who was not trying to laugh in that moment. I also can't forget all the waffles I ate during (necessary) multiple trips to Désiré De LiIle either, or the tender braised pork cheeks at the iconic 7Schaken off the Grote Markt in Antwerp. But what I remember most about our journey is slipping back into a feeling of comfort with my sister, one that even after such a long period of separation remained intact. That feeling was like having a warm blanket wrapped around my shoulders, old and familiar. Traveling as a family is a luxury for us, so we do it less often than we would like. Even as far apart as we are in distance, I think of our Belgian family often, wonder what they are up to, imagine them walking down streets that smell of warm bread or cooking waffles. People we love can come alive for us through a photo, a call and of course, even a dish. This one ties me to my sister. This recipe steps a little bit away from the traditional version of this dish. I know, I know. I did my best to stick with the original recipe, but there were a few things I couldn't help changing. First, in the traditional recipe, you are asked to make huge, fairly plain meatballs that you then boil (I think this is because they are so huge). I pan fried mine instead. Second, there are very few additions to the original version other than meat, salt, pepper and some nutmeg. I wanted more tenderness and flavor, so I made some additions, as you'll see below. Third, taking a cue from the Scandinavian versions of this homey dish, I decided to add a gravy. It seems silly not to when you are pan frying, since all the flavor ends up in the bits that collect in the bottom of the pan. Scrape it up, add some liquid, flour and in this case, a bit of tangy buttermilk and you've got yourself a really tasty sauce. Serve it all up with a rich cherry sauce and you have a worthy tribute to long-distance sisterhood. Adapted from Fans of Flanders. 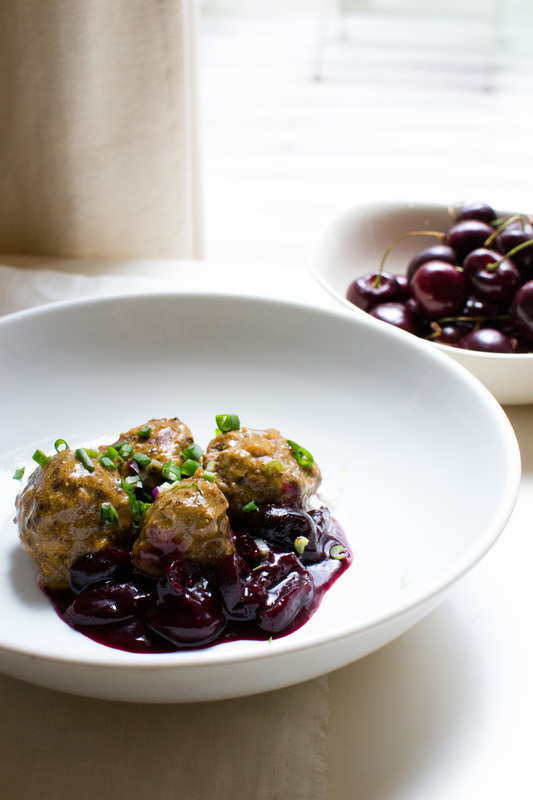 Serve meatballs with cherry sauce on the side. Friekedellen! When I was growing up, pot stickers were an exotic thing to me. The "Chinese" food we ate in our house was almost entirely of the Cantonese variety. There were some small exceptions, like the jars of smokey, wok-stirred chili oil that my aunt from Shanghai would make. Pot stickers - a northern Chinese or Taiwanese specialty called jiaoze, were something we only had on occasion and never at home. Chinese hands, rolling out dough. There were infrequent trips to the Taiwanese dumpling place outside of Cantonese Chinatown where we lived. Bottles of vinegar and dark soy sauce sat on the tables. My mouth always started watering as I got ready to dunk the puffy, crispy dumplings into the vinegar and soy dipping sauce. So good. Thin, but not as thin as a wonton skin. When my mom comes to visit a few times a year now, we make wontons, the Cantonese cousin to the pot sticker. We put together massive quantities that require every able-bodied person in the house to help. We eat many then freeze as many to consume slowly until the next time “Po Po” (grandmother) comes to visit. Half a tablespoon of filling per dumpling is plenty. Our most recent group cooking effort included pork wontons seasoned with coriander, cumin and turmeric. We get adventurous and step outside of the usual taste parameters around here when it comes to meat wrapped in thin dough skins. These got eaten before my brother suggested we try serving them in a cream sauce. While wontons are light and ethereal, cloud puffs that float to the top of a clear, clean-tasting broth, potstickers are made of thicker, egg-free dough. The bottoms brown to a crisp before water is added, creating billows of steam that cause the tops to puff and the meat filling to cook through. The liquid cooks off, reinforcing the bottom crust. Good pot stickers are moist, crispy and chewy. Just a few will fill you up. They are satisfyingly of the earth while wontons are of the sky, for the dreamers among us. In some ways, potstickers are the complete opposite of wontons. The yin to the wonton’s yang. Start from the middle, make one pleat then work to the right, adding two more pleats. Cute, huh? Lately, I’ve been craving potstickers. And, I was thinking about how my mom would use garlic chives that we kids would forage from along the railroad tracks behind our house in northeast L.A. I had no idea what these greens were called as I yanked them from the sandy soil. To me, they were stinky and unruly looking weeds. Our mom cooked with them unapologetically. Back then, we didn’t care that there was brake dust, creosote vapors, or god knows what else on our greens. They grew freely and were, well. Free! I’ve included a liberal amount of regular chives here, since they are growing in our garden. They aren’t anywhere near as pungent as the flat-leaved garlic chive variety of my childhood. So, I've added some actual garlic to the mix. I've also included some of the slightly bitter dandelion greens we "weeded" out from under our plum tree this morning. Nothing wrong with some free greens, right? Especially if they are nutritious and tasty. The filling is thus slightly onion-y and definitely garlicky, with a bitter edge to round out the pork's richness. Pot stickers indubitably of the earth. Also included are directions for making the dumpling skins. I urge you to make them instead of buying them. Homemade definitely tastes better here and this soft, pliable dough is easy - and even dreamy, I'd dare say - to work with. Hope you enjoy these earthly dumplings as much as I did. Sorry dreamers, there will be a recipe just for you soon! Combine the cabbage, dandelion greens and 1 ½ teaspoons of the salt in a bowl and set aside for 30 minutes. Place the cabbage and greens in a kitchen towel, gathering it together. Wring as much water as possible out. This will help the filling come together better. In another large bowl, combine cabbage, dandelion greens, pork, chive, ginger, garlic, soy sauce, sesame oil, remaining salt and egg. Mix gently but well. In a large stainless-steel bowl, stir together the flour and salt. Add the boiling water slowly and in small increments, stirring in between additions until a ball is formed and the dough is no longer too hot to handle. More or less water may be needed, depending on the day’s humidity. Knead dough on a floured work surface for at least 15 minutes. You may also use a stand mixer with a dough hook attachment for 7 minutes instead. Form dough into a ball and place it in the same bowl covering it with a damp towel. Allow to rest for 1 hour. To make the wrappers, add a generous coating of flour to the work surface. Divide dough in half. Shape one half into a log (I roll it between my hands forming a “snake”) until it is about 1 inch in diameter. Cut into ½-inch pieces. Stand each piece on its cut end and press down with the palm of your hand. Roll into circles 3 inches in diameter and 1/16th of an inch thick. Place about ½ a teaspoon of filling in the center of the wrapper. Fold in half to form a half-moon. Seal the top center of each dumpling by pressing between your fingers. Starting there, make 3 pleats going from the middle toward the right. Repeat, going toward the bottom left. Press your dumpling gently to flatten the bottom. Heat a large skillet over high heat. Add the oil and swirl to coat. When oil is hot, add the pot stickers with their flattened bottoms down. It’s helpful to place them in rows going in one direction. These dumplings enjoy snugging together, so let them. Cook undisturbed on medium-high for five to six minutes. Then, add about ½ cup of water and immediately covered (or you will be getting a steam facial!). In another minute, lift the cover to check water level. You want to make sure about 1/8 of an inch of water remains. If not, add more water. All pot stickers to steam until water has evaporated, up to 10 minutes. If your water evaporates before the pot stickers are done, add water in ¼ cup increments. If the opposite occurs and the pot stickers seem done but liquid remains, drain the liquid and put the pan back on the heat to evaporate any remaining liquid. Allow pot stickers to recrisp on the bottom, another 2 to 3 minutes. Cook the pot stickers as above in batches. You may serve the pot stickers with a dipping sauce made by mixing together equal parts soy sauce and rice wine vinegar and a spot of toasted sesame oil. Sometimes I also like to mix in a bit of honey or sugar. And there you have it: Jiaoze!